The wonderful group of companions that overcame danger and evil in book one of the Chronicles of Prydain return for a second bold adventure in The Black Cauldron. This time, Taran is called away by Prince Gwydion on a quest to seize the cauldron that belongs to the evil Lord Arawn. Within this vessel the Dark Lord creates his cauldron-born, those “mute and deathless warriors who serve the Lord of Annuvin. These are the bodies of the slain, steeped in Arawn’s cauldron to give them life again.” To diminish the evil that threatens all of Prydain, the cauldron MUST be destroyed. Taran, ever ready to prove his budding manhood, leaps at the opportunity. So, too, does the ever-faithful Gurgi with his poor tender head and Princess Eilonwy whose mouth never does stop running, even though the two have been commanded to stay behind. They join Fflewddur Flam, who is still having a great deal of trouble with snapping harp strings, and the dwarf, Doli, who has at last mastered the art of becoming invisible, though it does make his ears buzz something terrible. (“Hornets! Wasps! A whole swarm of bees!”) Yet our companions soon learn the Black Cauldron can only be destroyed at the highest cost, that of a life willingly given. And so, Taran Pig-Keeper’s second adventure proves as dangerous, fun and rewarding as the last. Maybe it’s even meant to be, “for there is a destiny laid on everything; on big, ugly Crochans as well as poor ugly ducklings, and a destiny laid even on us.” And through it Taran learns some valuable lessons about friendship, honor, betrayal and forgiveness. “It is easy to judge evil unmixed,” Gwydion tells him, “but alas, in most of us good and bad are closely woven as the threads on a loom; greater wisdom than mine is needed for the judging.” Wisdom, perhaps, that we all need to keep in mind when we’re wronged. The Chronicles of Prydain is turning out to be absolutely remarkable and worthy of its legendary status. (And they’re all newly on Kindle!) This volume won Newbery Honors in 1966. This series is highly, highly recommended–my very highest recommendation–for middle readers 8-13. I have watched the movie (we actually own it – one of my mom’s favorites). I didn’t know that there is a series of books that went with it! I have to check out the series! I didn’t know there were movies! Awesome! I can tell you are certainly excited about this series! I’m not familiar with the series, so I appreciated learning a bit about the first book first. I bet the tweens really like the series as it is action-packed, deals with good and evil, yet has a lot of great messages. Great review. I was really excited to find out this series is as top-notch as I’ve been hearing. Should have read it years ago. 🙂 It’s almost 50 years old now and doesn’t seem to be as popular as, say, Narnia. Hopefully this will prompt some new readers. Thank you so much for reviewing these! I actually read The Book of Three back in 5th grade as part of an honors reading class. I fell in love with these books, dug up the entire series in hardback form and dragged them through my classes the rest of the year along with my other homework. I just couldn’t bear to part with them! This is always my #1 suggestion to friends, family and strangers for their kids 8-12 years old, and I’m glad it has become your highest recommendation as well. Thank you, again! Funny how books affect us, isn’t it? I wish I had discovered these much sooner. i absolutely LOVE the Prydain Chronicles, being an adult and still have the love i developed as a kid for books i can truly say that when reading books like these or Narnia i might even enjoy them more than i did when i was young..
Because now i really get the messages and take more time to think over the details left in the book, it’s amazing how books like these indirectly make us the people we are today. I really enjoyed your review, greeting from Belgium! I recently got through some bad times and when i do, i turn to C.S. Lewis first to make me see the beauty of life again, when things go bad i just need Aslan to comfort me and make me feel that everyting is going to be alright, it’s quite akward because i started reading The Chronicles of Narnia for the first time when i was nineteen and had devoured books when i was a kid. Thanks for your very kind comments, Thijs. Narnia has a very special place in my heart, as well. I read them when I was eleven for the first time and fell in love with the characters (especially Aslan) and the fantasy. Then I read them again in college and my eyes were opened to some of Lewis’s deeper meanings. I, too, find great comfort in them, because they so closely represent my faith. Lord of the Rings is another series that made a huge impression on me, though I was in my early twenties by that time. I sure wish I had found Prydain much earlier. All these books celebrate such much that is GOOD that it’s easy to get swept away by them. I love to get swept away by them! Thijs, I love your long comments. Anytime, my friend. It’s a pleasure to talk books! No, I haven’t read many of Lewis’ works outside of Narnia. A few, but not this one. I’ll put it on my tbr list. Lewis completely defies that stereotype that faith and intelligence/logic can’t go hand-in-hand. 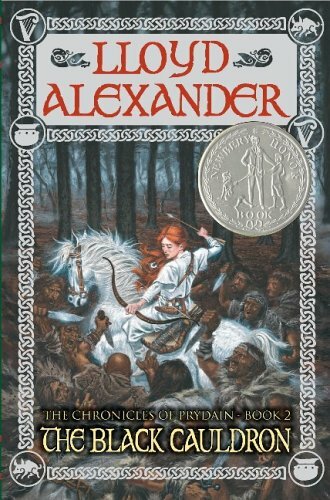 It’s sooo great to know you’re reading the first novel again with your homeschooled, everybody that know of the Prydain Chronicles should share it! I read many reviews and came to notice that most Prydain readers don’t like the first one as much as the rest, well i can say i find it a very nice beginning to a series and enjoyed it very much tghe first time i had read it..
Lol, Gurgi grew on me, too. It’s hard when any great character falls. I like the first book just as much as any of the others. Like you said, it’s a great way to start the series. Taran can’t mature unless he starts out immature. And the horned king evoked just the right amount of dread. Like all the books, it was chock full of beauty, wisdom, and poetic prose. I was thrilled to find the series as good as I had always heard and quickly devoured the remaining four books. If Book of Three hadn’t been worthy, I probably wouldn’t have moved on. But it was, and I did. And they rate among my all-time favorites. Chapter 5 of The High King at the moment, i can’t remember this happened to Rhun, i really don’t like it he of all people didn’t deserve that! Specifics of book five are escaping me right now. Good thing I’m rereading, too! I just finished book one with my son on Friday. (I forgot how much I like Eilonwy!) On to the next one Monday. I do remember Arawn’s end not being as climatic as I thought it could be, but I need a refresher there, too. Enjoy the rest of it! I liked Eilonwy very much too from the start of The Book of Tree :D, i finally finished the last chapter of The High King and to be honest i could have finished it much earlier but just didn’t want it to end 🙂 Things finally explained like the book of tree itself and when Taran learns of how Dallben came across him and Orwen, Orgoch and Orddu when they come to him the night before leaving of to the Summer Country. I regret finishing it for the second time without a chance to re-read them a third time because i made myself a list of all books i should read again who did give me that feeling. Then i’m going back to read The Neverending Story once more because this book really is ONE of a kind! Next up i have The Once and Future King by Terence H. White, a book (or series rather because it consists of 4 books) i will never ever forget. Then i’m going to pick up Clarke’s Jonathan Strange and Mr. Norell, a book wich i think puts a spell on everyone that reads it! At the last of my list i got The Magician by Raymond Feist, i read this when i was just a kid, i was the only one of my age that loved it 😀 and ofcource the Potter series by Rowling and The Wheel of Time with at the very end The Hobbit by Tolkien. I know you understand books the way i do and that’s why i just felt i needed to post the list of books that started this conversation about Prydain at all so if you got the time and some of the books that made me feel like Alexander’s Prydain Chronicles made me feel sound good to you, you should make a review about one of them, i would love to see that! I wish you all the best, and keep enjoying the books! I love your long post, Thijs! It is fun to get excited about books with someone who understands. One book I’d recommend to you is The Princess and the Goblin, by George McDonald. (My review: http://wp.me/pFR7E-16o) It has some theology/fantasy elements similar to CS Lewis. In fact, Lewis admits he was strongly influenced by McDonald. I first read it in college and loved it. I reread it this year and loved it again. People that read books nowadays are rare, people that understand what books do to you like us are even more rare.. But i don’t have high expectations of The Hobbit though, at first when i first heard they were finally going to adapt it into a movie i was very excited ofcourse, and when i heard they would be doing it in 2 parts i got even more excited because they would have the chance to add more from the book because movies mostly don’t include all things that were in the book. But then again, i haven’t seen it YET! So maybe they did a really good job on it and maybe i’ll enjoy it very much, i’ll let you know as soon as i see it! And keep enjoying Prydain, i will too! Because i ordered The Prydain Chronicles in english so i can re-read them in their original language and i just read The Foundling and Other Stories of Prydain, i tell you, a MUST to read if you love the Prydain Chronicles, it just gives so much insight, to know how Dallben got by the Book of Tree, how Coll saved Hen Wen from Annuvin and the history of Dyrnwyn and many other stories is just a really nice bonus and an even more enjoyable read because you’ve read the whole series before it! Looking forward to reading your Narnia reviews Michelle, i really do! And now i think of it, you should really read Arthur: The Once and Future King too as the first part of it was adapted into the animated picture of Disney The Sword in The Stone named after the first part of the book too! I was just reading your Harry Potter reviews and when you said They reminded you of the movie i thought of this book also wich i enjoyed very much as i had seen the animated movie too before reading it! I just put all those books on my tbr list. I hadn’t actually done it yet, and last night I was looking through my list and ordered three books from the library to read over Christmas break. I wish now I had remembered your recommendations! My reading slows down when I’m also writing, but I’ll read your list early next year. I’m really interested in them! I want to read the Prydain back stories as soon as I’m done rereading the books. And I’m very curious about The Neverending Story. I did not grow up with movies. My parents chose to spend leisure money on family vacations instead, which I’ve never regretted, and we didn’t get a VCR until 10th grade. I only saw this one with my kids a few years back. I didn’t realize it was based on a novel. Thijs, I’m curious where you live. I may come off as a stupid American :), but I’m guessing Denmark or Norway, based on the spelling of your name? Your English is phenomenally good. It’s absolutely perfect. Were it not for your name and your mention of language in your last post, I would guess it was your native language. Have a Merry Christmas, Thijs! Hi Michelle, first off i wish you a very late happy newyear! But still, i read more Young Adult novels and my favorite series is Narnia which are written for children. As what i’m reading now is the Harry Potter series again, i’m at the last chapter of Chamber and really keep enjoying them the way i used to when i first read them and that’s a really long time ago 🙂 by Christmas i finished The Neverending Story (can’t explain how epic this book is, it’s really hard to imagine it’s written for children/young adults because some things in this book you only understand fully when you’re an adult) and got my boxed set of the original Chronicles of Prydain, i really love them in english i like them even better in their original language! I’m from Belgium remember 😀 and you don’t come off as a stupid American to me honestly, i enjoy talking with you and now that i come to think of it i mostly enjoyed talking to American people! And thank you for the compliment on my english i really appreciate it! I think it’s because i did grew up with movies unlike you, which to me isn’t a bad thing at all, i wish i could let my kids grow up in the future without all that much television and gaming and more books. But when i look around me nowadays and see all these kids staring at their little screens instead of reading books i think i’m gonna have to put a lot of effort in it..
Again greetings from Belgium Michelle, i really like to hear what books you’re reading at the moment! We have tv and ipod/game limits and reading minimums in our house, but it’s still tough to keep kids on track. They just gravitate to the former and see what they can get away with. I have to stay on them. But I think it’s worth it. I wish they’d gravitate to the books! Oh, I really want to read Harry again! I love that series. I read it with each kid when they turn 12 and then watch the movies, just that kid and me. It’s fun mom and kid time. It sure takes a while! Thanks for writing again, Thijs. I’m off now to finish the cover image for my new book. I’m only 17,000 words into what will be a 50,000 MG adventure, but most of that I did this month. Hope to have it out in May or June, but I’ll be revealing the cover soon. It turned out so cool! It’s great to hear you picked up The Neverending Story, Arthur AND The Magicians! I ensure you that you will love every one of them, i think you’ll like Story best, already can’t wait to hear about it! I already told you about Story, and The Magicians is in fact a book that Grossman wrote asking himself the question: “what if Harry Potter and Narnia would be more realistic and mature like this world we currently know is. Narnia are also his favorite novels and when you read it you know he did an excellent job. White on the other hand deals with a completely different story, one everybody knows, starting with Arthur’s childhood and him maturing under the teachings of Merlin by turning him into all kinds of animals, well, you’ve seen the animated movie 🙂 The way White tells the story of King Arthur from his childhood to his deathbed is magnificent! I can’t wait to see the cover and can’t wait even more to begin reading your novels! I think I know what you mean about needing to reread your favorite books. Let’s see if I can put the thoughts in English for you. 🙂 In the same way we recall old memories with those we love, we also revisit those old books. They become just as much a part of us. Sharing them with others, re-experiencing them ourselves keeps them alive. To let them extinguish would be as tragic as senility or memory loss, so every so often we sharpen them up with a reread. At least that’s how it is with me. I always read right before bed, too, no matter what. It relaxes me and helps me sleep. And I love to do it. It’s slow going, though, when I only read a chapter or three at a time.